World Bank Vice President for Europe and Central Asia Cyril Muller has said Ukraine has been reaching a sustainable approach to the implementation of reforms and the World Bank will continue to provide its assistance to it. "I would like to mention your leadership in implementing plenty of things. Last year the government had to introduce a lot of reforms. When we are talking about our relations with Ukraine, we can state a change in rhetoric. Ukraine is reaching a sustainable approach to implementing reforms, and we continue to support you. We want to provide not only financial support but also contribute to the implementation of government programs," the press service of the Cabinet of Ministers quoted Muller as saying following his meeting with Prime Minister Volodymyr Groysman. In his turn, Groysman said the support of international partners for Ukraine is an additional incentive for making changes in all the areas, starting with creating a favorable business climate and modernizing the financial and energy sectors and ending with approving new principles of state governance. "It is also indicative that the context of cooperation with the World Bank is further reinforced by specific joint projects in the agricultural sector, industry, corporate governance, infrastructure, education and the general development of human capital in Ukraine," the press statement says. 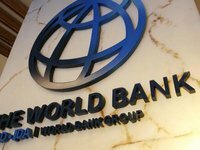 It is noted that as of January 2019, Ukraine had eight joint investment projects in progress with the World Bank to the tune of more than $2.4 billion and a deed of project support and guarantee for $750 million.